Dry Molybdenum Lubricant | High Temperature | Extreme Pressure | Superior Industries, Inc.
A dry lubricant film designed for extreme conditions. Dry Trac features micro-particles that burnish themselves into metal to repel dust and dirt. Dry Trac penetrates to the core of cables and chains to provide superior friction reduction and wear resistance. It adheres to all types of materials including metal, glass, rubber and plastic. Dry Trac contains PURE MOLYBDENUM DISULFIDE which makes it ideal for high pressure load-bearing applications in harsh environments where synthetic or petroleum lubricants are not ideal. 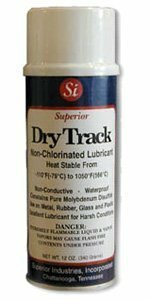 A dry molybdenum lubricant, Dry Trac is designed for use where conventional lubricants are not acceptable. The dry lubricant contains pure molybdenum and is recommended for lubricating chains, cables, tenter frame adjustment screws and many industrial, mining and construction types of equipment. It is considered an anti seize and anti friction lubricating film. It is recommended for use where temperatures range from -110°F (-79°C) to +1050°F (+566°C). Dry Trac molybdenum lubricant stops rust and corrosion and is highly resistant to chemicals, most acids and other corrosive materials. It displays outstanding resistance to salt spray and is recommended for offshore drilling platforms for a variety of lubricating applications. This dry lubricant product exhibits outstanding resistance to extreme pressures and shear associated with mining and drilling equipment. Dry Trac is the product of choice for lubricating tenter frame adjustment screws. 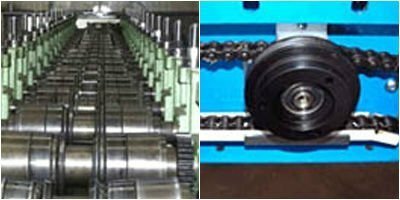 In textile plants, the lubricant used must be drip free to insure no possibility of dripping on finished goods. It prevents seizing and galling of these type screws and provides for easy adjustments. A dry chain lube, this product is also excellent for lubricating lint screen chains in carpet mills. It is resistant to dyes and chemicals found on this type equipment. In applications where airborne lint is found, this product is excellent for lubrication of most all equipment. As a dry lubricant, it is completely dry and does not attract lint. Dry Trac molybdenum lubricant is also recommended for bearing lubrication in this type environment. 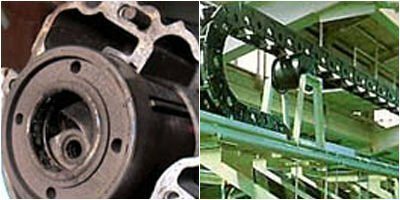 In block manufacturing plants, a dry lubricant is required for many lubrication needs and Dry Trac molybdenum lubricant is the product of choice. Not only does this product lubricate, it protects from excess wear and prevents seizing of equipment parts. Dry Trac is excellent for lubricating cables where sand or other contaminants can cause excessive wear. Sand is very abrasive and does not stick to dry lubricants such as Dry Trac.